Description - Are you tired of refinishing your deck every year? Are you tired of getting splinters? Then you need composite decking. Century Outdoor Living Deck Boards are great alternative to standard wood for your decking. Composed of bamboo and plastic, this Eco-friendly decking will not splinter, rot or crack and is resistant to bugs. These composite deck boards are backed by a 20 year warranty. Weight – 26.46 Lbs. per board. Recommended Uses – Century Outdoor Living Deck Boards are a great alternative to wood and are used as flooring for outdoor decks, outdoor patios, and much more. 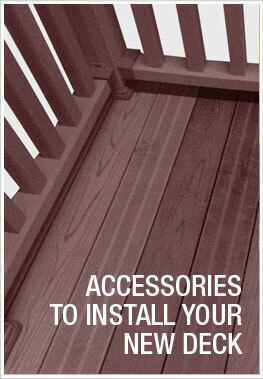 Century Outdoor decking boards are easy to install. For printable installation instructions, please Click Here. Resistant to rot, cracking and fading. can i install composite deck tiles directly on top of new solid wood deck. will i need to screw down. The great thing about tiles is that they allow for a free floating installation, and do not need to be screwed town. However, deck boards require a different installation.